Background Several scales, checklists and domain-based tools for assessing risk of reporting biases exist, but it is unclear how much they vary in content and guidance. We conducted a systematic review of the content and measurement properties of such tools. Methods We searched for potentially relevant articles in Ovid MEDLINE, Ovid Embase, Ovid PsycINFO and Google Scholar from inception to February 2017. One author screened all titles, abstracts and full text articles, and collected data on tool characteristics. Results We identified 18 tools that include an assessment of the risk of reporting bias. Tools varied in regard to the type of reporting bias assessed (eg, bias due to selective publication, bias due to selective non-reporting), and the level of assessment (eg, for the study as a whole, a particular result within a study or a particular synthesis of studies). Various criteria are used across tools to designate a synthesis as being at ‘high’ risk of bias due to selective publication (eg, evidence of funnel plot asymmetry, use of non-comprehensive searches). However, the relative weight assigned to each criterion in the overall judgement is unclear for most of these tools. Tools for assessing risk of bias due to selective non-reporting guide users to assess a study, or an outcome within a study, as ‘high’ risk of bias if no results are reported for an outcome. However, assessing the corresponding risk of bias in a synthesis that is missing the non-reported outcomes is outside the scope of most of these tools. Inter-rater agreement estimates were available for five tools. Conclusion There are several limitations of existing tools for assessing risk of reporting biases, in terms of their scope, guidance for reaching risk of bias judgements and measurement properties. Development and evaluation of a new, comprehensive tool could help overcome present limitations. Tools for assessing risk of reporting biases, and studies evaluating their measurement properties, were identified by searching several relevant databases using a search string developed in conjunction with an information specialist. Detailed information on the content and measurement properties of existing tools was collected, providing readers with pertinent information to help decide which tools to use in evidence syntheses. Screening of articles and data collection were performed by one author only, so it is possible that some relevant articles were missed, or that errors in data collection were made. The search of grey literature was not comprehensive, so it is possible that there are other tools for assessing risk of reporting biases, and unpublished studies evaluating measurement properties, that were omitted from this review. Previous researchers have summarised the characteristics of tools designed to assess various sources of bias in randomised trials,12–14 non-randomised studies of interventions (NRSI),14 15 diagnostic test accuracy studies16 and systematic reviews.14 17 Others have summarised the performance of statistical methods developed to detect or adjust for reporting biases.18–20 However, no prior review has focused specifically on tools (ie, structured instruments such as scales, checklists or domain-based tools) for assessing the risk of reporting biases. A particular challenge when assessing risk of reporting biases is that existing tools vary in their level of assessment. For example, tools for assessing risk of bias due to selective publication direct assessments at the level of the synthesis, whereas tools for assessing risk of bias due to selective non-reporting within studies can direct assessments at the level of the individual study, at the level of the synthesis or at both levels. It is unclear how many tools are available to assess different types of reporting bias, and what level they direct assessments at. It is also unclear whether criteria for reaching risk of bias judgements are consistent across existing tools. Therefore, the aim of this research was to conduct a systematic review of the content and measurement properties of such tools. Methods for this systematic review were prespecified in a protocol which was uploaded to the Open Science Framework in February 2017 (https://osf.io/9ea22/). Tools with a broad scope, for example, to assess multiple sources of bias or the overall quality of the body of evidence, were eligible if one of the items covered risk of reporting bias. Multidimensional tools with a statistical component were also eligible (eg, those that require users to respond to a set of questions about the comprehensiveness of the search, as well as to perform statistical tests for funnel plot asymmetry). In addition, any studies that evaluated the measurement properties of existing tools (eg, construct validity, inter-rater agreement, time taken to complete assessments) were eligible for inclusion. Papers were eligible regardless of the date or format of publication, but were limited to those written in English. On 9 February 2017, one author (MJP) searched for potentially relevant records in Ovid MEDLINE (January 1946 to February 2017), Ovid Embase (January 1980 to February 2017) and Ovid PsycINFO (January 1806 to February 2017). The search strategies included terms relating to reporting bias which were combined with a search string used previously by Whiting et al to identify risk of bias/quality assessment tools17 (see full Boolean search strategies in online supplementary table S1). To capture any tools not published by formal academic publishers, we searched Google Scholar using the phrase ‘reporting bias tool OR risk of bias’. One author (MJP) screened the titles of the first 300 records, as recommended by Haddaway et al.25 To capture any papers that may have been missed by all searches, one author (MJP) screened the references of included articles. In April 2017, the same author emailed the list of included tools to 15 individuals with expertise in reporting biases and risk of bias assessment, and asked if they were aware of any other tools we had not identified. availability of guidance to assist with completion of the tool (eg, guidance manual). estimate (and precision) of psychometric statistics (eg, weighted kappa; κ). We summarised the characteristics of included tools in tables. We calculated the median (IQR) number of items across all tools, and tabulated the frequency of different criteria used in tools to denote a judgement of ‘high’ risk of reporting bias. We summarised estimates of psychometric statistics, such as weighted κ to estimate inter-rater agreement,26 by reporting the range of values across studies. For studies reporting weighted κ, we categorised agreement according to the system proposed by Landis and Koch,27 as poor (0.00), slight (0.01–0.20), fair (0.21–0.40), moderate (0.41–0.60), substantial (0.61–0.80) or almost perfect (0.81–1.00). In total, 5554 records were identified from the searches, of which we retrieved 165 for full-text screening (figure 1). The inclusion criteria were met by 42 reports summarising 18 tools (table 1) and 17 studies evaluating the measurement properties of tools.3 4 21 28–66 A list of excluded papers is presented in online supplementary table S2. No additional tools were identified by the 15 experts contacted. Flow diagram of identification, screening and inclusion of studies. aRecords identified from Ovid MEDLINE, Ovid Embase, Ovid PsycINFO and Google Scholar. bRecords identified from screening references of included articles. SR, systematic review. Nearly all of the included tools (16/18; 89%) were domain-based, where users judge risk of bias or quality within specific domains (table 2; individual characteristics of each tool are presented in online supplementary table S3). All tools were designed for generic rather than specific use. Five tools focused solely on the risk of reporting biases3 28 29 47 48; the remainder addressed reporting biases and other sources of bias/methodological quality (eg, problems with randomisation, lack of blinding). Half of the tools (9/18; 50%) addressed only one type of reporting bias (eg, bias due to selective non-reporting only). Tools varied in regard to the study design that they assessed (ie, randomised trial, non-randomised study of an intervention, laboratory animal experiment). The publication year of the tools ranged from 1998 to 2016 (the earliest was the Downs-Black tool,31 a 27-item tool assessing multiple sources of bias, one of which focuses on risk of bias in the selection of the reported result). Assessments for half of the tools (9/18; 50%) are directed at an individual study (eg, tool is used to assess whether any outcomes in a study were not reported). In 5/18 (28%) tools, assessments are directed at a specific outcome or result within a study (eg, tool is used to assess whether a particular outcome in a study, such as pain, was not reported). In a few tools (4/18; 22%), assessments are directed at a specific synthesis (eg, tool is used to assess whether a particular synthesis, such as a meta-analysis of studies examining pain as an outcome, is missing unpublished studies). The content of the included tools was informed by various sources of data. The most common included a literature review of items used in existing tools or a literature review of empirical evidence of bias (9/18; 50%), ideas generated at an expert consensus meeting (8/18; 44%) and pilot feedback on a preliminary version of the tool (7/18; 39%). The most common type of guidance available for the tools was a brief annotation per item/response option (9/18; 50%). A detailed guidance manual is available for four (22%) tools. Four tools include items for assessing risk of bias due to both selective publication and selective non-reporting.29 33 45 49 One of these tools (the AHRQ tool for evaluating the risk of reporting bias29) directs users to assess a particular synthesis, where a single risk of bias judgement is made based on information about unpublished studies and under-reported outcomes. In the other three tools (the GRADE framework, and two others which are based on GRADE),33 45 49 the different sources of reporting bias are assessed in separate domains (bias due to selective non-reporting is considered in a ‘study limitations (risk of bias)’ domain, while bias due to selective publication is considered in a ‘publication bias’ domain). Five tools21 28 43 44 47 guide users to assess risk of bias due to both selective non-reporting and selection of the reported result (ie, problems with outcomes/results that are not reported and those that are reported, respectively). Four of these tools, which include the Cochrane risk of bias tool for randomised trials21 and three others which are based on the Cochrane tool,43 44 47 direct assessments at the study level. That is, a whole study is rated at ‘high’ risk of reporting bias if any outcome/result in the study has been omitted, or fully reported, on the basis of the findings. All 15 tools with an assessment of the risk of bias due to selective non-reporting suggest that the risk of bias is ‘high’ when it is clear that an outcome was measured but no results were reported (table 4). Fewer of these tools (n=8; 53%) also recommend a ‘high’ risk judgement when results for an outcome are partially reported (eg, it is stated that the result was non-significant, but no effect estimate or summary statistics are presented). The eight tools that include an assessment of the risk of bias in selection of the reported result recommend various criteria for a ‘high’ risk judgement (table 5). These include when some outcomes that were not prespecified are added post hoc (in 4 (50%) tools), or when it is likely that the reported result for a particular outcome has been selected, on the basis of the findings, from among multiple outcome measurements or analyses within the outcome domain (in 2 (25%) tools). Despite identifying 17 studies that evaluated measurement properties of an included tool, psychometric statistics for the risk of reporting bias component were available only from 12 studies43 44 54–60 62 64 66 (the other five studies include only data on properties of the multidimensional tool as a whole31 53 61 63 65; online supplementary table S5). Nearly all 12 studies (11; 92%) evaluated inter-rater agreement between two assessors; eight of these studies reported weighted κ values, but only two described the weighting scheme.55 62 Eleven studies43 44 54–60 64 66 evaluated the measurement properties of tools for assessing risk of bias in a study due to selective non-reporting or risk of bias in selection of the reported result; in these 11 studies, a median of 40 (IQR 32–109) studies were assessed. One study62 evaluated a tool for assessing risk of bias in a synthesis due to selective publication, in which 44 syntheses were assessed. In the studies evaluating inter-rater agreement, all involved two assessors. From a systematic search of the literature, we identified 18 tools designed for use by individuals performing evidence syntheses to assess risk of reporting biases in the included studies or in their synthesis of studies. The tools varied with regard to the type of reporting bias assessed (eg, bias due to selective publication, bias due to selective non-reporting), and the level of assessment (eg, for the study as a whole, a particular outcome within a study or a particular synthesis of studies). Various criteria are used across tools to designate a synthesis as being at ‘high’ risk of bias due to selective publication (eg, evidence of funnel plot asymmetry, use of non-comprehensive searches). However, the relative weight assigned to each criterion in the overall judgement is not clear for most of these tools. Tools for assessing risk of bias due to selective non-reporting guide users to assess a study, or an outcome within a study, as ‘high’ risk of bias if no results are reported for an outcome. However, assessing the corresponding risk of bias in a synthesis that is missing the non-reported outcomes is outside the scope of most of these tools. Inter-rater agreement estimates were available for five tools,4 21 43 44 62 and ranged from poor to substantial; however, the sample sizes of most evaluations were small, and few described the weighting scheme used to calculate κ. There are several strengths of this research. Methods were conducted in accordance with a systematic review protocol (https://osf.io/9ea22/). Published articles were identified by searching several relevant databases using a search string developed in conjunction with an information specialist,17 and by contacting experts to identify tools missed by the search. Detailed information on the content and measurement properties of existing tools was collected, providing readers with pertinent information to help decide which tools to use in future reviews. However, the findings need to be considered in light of some limitations. Screening of articles and data collection were performed by one author only. It is therefore possible that some relevant articles were missed, or that errors in data collection were made. The search for unpublished tools was not comprehensive (only Google Scholar was searched), so it is possible that other tools for assessing risk of reporting biases exist. Further, restricting the search to articles in English was done to expedite the review process, but may have resulted in loss of information about tools written in other languages, and additional evidence on measurement properties of tools. Other systematic reviews of risk of bias tools12–17 have restricted inclusion to tools developed for particular study designs (eg, randomised trials, diagnostic test accuracy studies), where the authors recorded all the sources of bias addressed. A different approach was taken in the current review, where all tools (regardless of study design) that address a particular source of bias were examined. By focusing on one source of bias only, the analysis of included items and criteria for risk of bias judgements was more detailed than that recorded previously. Some of the existing reviews of tools15 considered tools that were developed or modified in the context of a specific systematic review. However, such tools were excluded from the current review as they are unlikely to have been developed systematically,15 67 and are difficult to find (all systematic reviews conducted during a particular period would need to have been examined for the search to be considered exhaustive). Our analysis suggests that the factors that need to be considered to assess risk of reporting biases adequately (eg, comprehensiveness of the search, amount of data missing from the synthesis due to unpublished studies and under-reported outcomes) are fragmented. A similar problem was occurring a decade ago with the assessment of risk of bias in randomised trials. Some authors assessed only problems with randomisation, while others focused on whether trials were not ‘double blinded’ or had any missing participant data.70 It was not until all the important bias domains were brought together into a structured, domain-based tool to assess the risk of bias in randomised trials,21 that systematic reviewers started to consider risk of bias in trials comprehensively. A similar initiative to link all the components needed to judge the risk of reporting biases into a comprehensive new tool may improve the credibility of evidence syntheses. In particular, there is an emergent need for a new tool to assess the risk that a synthesis is affected by reporting biases. This tool could guide users to consider risk of bias in a synthesis due to both selective publication and selective non-reporting, given that both practices lead to the same consequence: evidence missing from the synthesis.11 Such a tool would complement recently developed tools for assessing risk of bias within studies (RoB 2.041 and ROBINS-I4 which include a domain for assessing the risk of bias in selection of the reported result, but no mechanism to assess risk of bias due to selective non-reporting). Careful thought would need to be given as to how to weigh up various pieces of information underpinning the risk of bias judgement. For example, users will need guidance on how evidence of known, unpublished studies (as identified from trial registries, protocols or regulatory documents) should be considered alongside evidence that is more speculative (eg, funnel plots suggesting that studies may be missing). Further, guidance for the tool will need to emphasise the value of seeking documents other than published journal articles (eg, protocols) to inform risk of bias judgements. Preparation of a detailed guidance manual may enhance the usability of the tool, minimise misinterpretation and increase reliability in assessments. Once developed, evaluations of the measurement properties of the tool, such as inter-rater agreement and construct validity, should be conducted to explore whether modifications to the tool are necessary. There are several limitations of existing tools for assessing risk of reporting biases in studies or syntheses of studies, in terms of their scope, guidance for reaching risk of bias judgements and measurement properties. Development and evaluation of a new, comprehensive tool could help overcome present limitations.
. Quality Assessment Tools Project Report. Ottawa: Canadian Agency for Drugs and Technologies in Health, 2012.
. 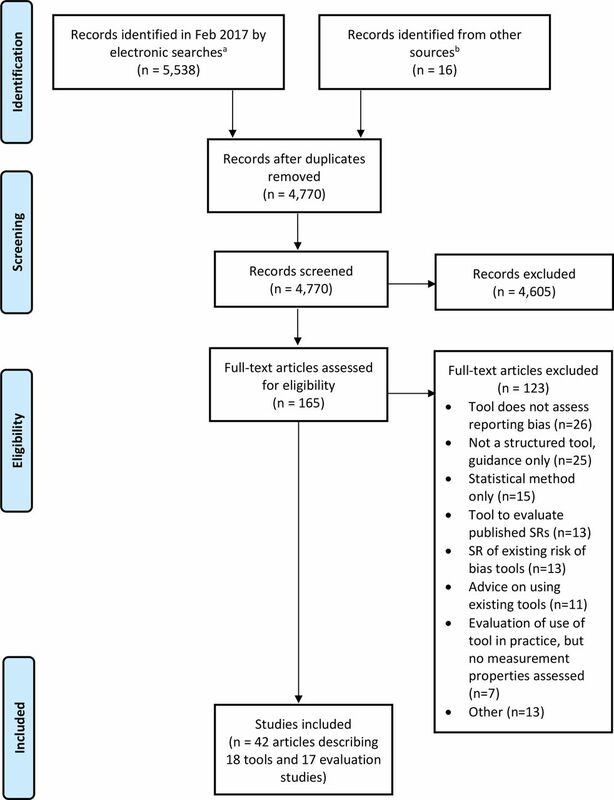 Evidence to inform the development of ROBIS, a new tool to assess the risk of bias in systematic reviews, September 2013. 2013 https://www.researchgate.net/publication/303312018_Evidence_to_inform_the_development_of_ROBIS_a_new_tool_to_assess_the_risk_of_bias_in_systematic_reviews (accessed 1 Aug 2017).
. Chapter 10: Addressing reporting biases. In: Higgins JPT , Green S , eds. Cochrane handbook for systematic reviews of interventions Version 510. Chichester, UK: John Wiley & Sons, 2011.
. Finding grey literature evidence and assessing for outcome and analysis reporting biases when comparing medical interventions: AHRQ and the Effective Health Care Program. (Prepared by the Oregon Health and Science University and the University of Ottawa Evidence-based Practice Centers under Contract Nos. 290-2007-10057-I and 290-2007-10059-I.) AHRQ Publication No. 13(14)-EHC096-EF. Rockville, MD: Agency for Healthcare Research and Quality, 2013.
. Chapter 15 Appendix A: A Tool for Evaluating the Risk of Reporting Bias (in Chapter 15: Grading the Strength of a Body of Evidence When Assessing Health Care Interventions for the Effective Health Care Program of the Agency for Healthcare Research and Quality: An Update). Methods Guide for Comparative Effectiveness Reviews (Prepared by the RTI-UNC Evidence-based Practice Center under Contract No. 290-2007-10056-I). AHRQ Publication No. 13(14)-EHC130-EF. Rockville, MD: Agency for Healthcare Research and Quality, 2013.
. Handbook for grading the quality of evidence and the strength of recommendations using the GRADE approach. http://gdt.guidelinedevelopment.org/app/handbook/handbook.html.
. Chapter 8: Assessing risk of bias in included studies. In: Higgins JPT , Green S , eds. Cochrane Handbook for Systematic Reviews of Interventions. Chichester (UK: John Wiley & Sons, 2008:187–241.
. Chapter 8: Assessing risk of bias in included studies. In: Higgins JPT , Green S , eds. Cochrane Handbook for Systematic Reviews of Interventions Version 5.1.0. London: The Cochrane Collaboration, 2011.
. Revised Cochrane risk of bias tool for randomized trials (RoB 2.0), Version 20. 2016 https://sites.google.com/site/riskofbiastool/ (accessed 19 Sep 2017).
. A revised tool for assessing risk of bias in randomized trials. Cochrane Methods Cochrane Database of Systematic Reviews 2016;10(Suppl 1):29–31.
. Selective reporting bias of harm outcomes within studies: findings from a cohort of systematic reviews. BMJ 2014;349:g6501.
. AHRQ Methods for Effective Health Care. Assessing Risk of Bias and Confounding in Observational Studies of Interventions or Exposures: Further Development of the RTI Item Bank. Rockville (MD: Agency for Healthcare Research and Quality (US), 2013.
. Risk of bias versus quality assessment of randomised controlled trials: cross sectional study. BMJ 2009;339:b4012.
. AHRQ Methods for Effective Health Care. Validity and Inter-Rater Reliability Testing of Quality Assessment Instruments. Rockville (MD: Agency for Healthcare Research and Quality (US), 2012.
. AHRQ Methods for Effective Health Care. Selective Outcome Reporting as a Source of Bias in Reviews of Comparative Effectiveness. Rockville (MD): Agency for Healthcare Research and Quality (US), 2012.
. Chapter 10: Addressing reporting biases. In: Higgins JPT , Churchill R , Chandler J , eds. Cochrane Handbook for Systematic Reviews of Interventions version 5.2.0. Chichester, UK: The Cochrane Collaboration, 2017. Contributors MJP conceived and designed the study, collected data, analysed the data and wrote the first draft of the article. JEM and JPTH provided input on the study design and contributed to revisions of the article. All authors approved the final version of the submitted article. Funding MJP is supported by an Australian National Health and Medical Research Council (NHMRC) Early Career Fellowship (1088535). JEM is supported by an NHMRC Australian Public Health Fellowship (1072366). JPTH is funded in part by Cancer Research UK Programme Grant C18281/A19169; is a member of the MRC Integrative Epidemiology Unit at the University of Bristol, which is supported by the UK Medical Research Council and the University of Bristol (grant MC_UU_12013/9); and is a member of the MRC ConDuCT-II Hub (Collaboration and innovation for Difficult and Complex randomised controlled Trials In Invasive procedures; grant MR/K025643/1). Competing interests JPTH led or participated in the development of four of the included tools (the current Cochrane risk of bias tool for randomised trials, the RoB 2.0 tool for assessing risk of bias in randomised trials, the ROBINS-I tool for assessing risk of bias in non-randomised studies of interventions and the framework for assessing quality of evidence from a network meta-analysis). MJP participated in the development of one of the included tools (the RoB 2.0 tool for assessing risk of bias in randomised trials). All authors are participating in the development of a new tool for assessing risk of reporting biases in systematic reviews.